Mumbai 17th July 2016: Maize also known as corn or our good old Bhutta/Makkai/Challi in Hindi, 'Mokka Jonnalu' in Telugu, 'Makkacholam' in Tamil, 'Cholam' in Malayalam, 'Musukina Jola' in Kannada, 'Makkai' in Gujarati, 'Makai' in Marathi and Punjabi and 'Butta' in Bengali. It is a large grain plant first domesticated by indigenous peoples in Mexico about 10,000 years ago. The 6 major types of corn are dent corn, flint corn, pod corn, popcorn, flour corn, and sweet corn. Baby corn is available in cans or jars in the supermarkets and is used in Asian cooking. This grain is generally available in summer and can be cooked in a variety of ways The best part of corn is that its not only delicious, but rich in vitamins, minerals and fiber thus have a lots of health benefits. The antioxidants present in corn also act as anti carcinogenic agents and prevent Alzheimer’s disease. Corn is high in soluble and insoluble fibre. The soluble fibre content of corn helps in blocking cholesterol absorption. The insoluble fibre in corn prevents constipation and promotes soft and bulky stool reducing the chances of Irritable Bowel Syndrome and diarrhea. Corn helps prevent digestive problems like constipation and hemorrhoids as well as colon cancer. Corn has a significant amount of vitamin B12 and folic acid, as well as iron, which is required to form new red blood cells. Deficiency of these cause anemia. As corn is a great source of iron, vitamin B12 and folic acid it helps in preventing Anemia. 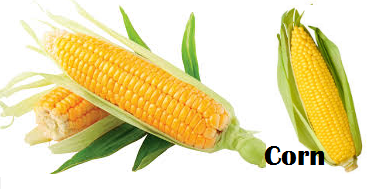 Corn is a good source of carbohydrates that provide energy to the body. A single cup serving of corn provides our body with 29gms of carbs. As corn is a complex carb, it gets digested at a slow pace, thus providing you with balanced energy levels. Corn is rich in vitamin C, carotenoids and bioflavonoids that keep your heart healthy by controlling the cholesterol levels and increasing the flow of blood. The soluble fiber present in corn helps in blocking cholesterol absorption by turning into a gel-like consistency, which in turn helps in lowering cholesterol. Corn contains phenolic phytochemicals. The phytochemicals regulate the absorption and release of insulin in the body, thus reducing the chances of spikes and drops iin blood glucose levels for diabetic patients and enabling them to maintain a normal lifestyle. Besides corn also contains pantothenic acid which supports metabolism. Hence, it prevents stress by supporting the functioning of the adrenal glands. As corn contains carotenoids that reduce the risk of macular degeneration. Beta-carotene helps in producing vitamin A, thus supporting improving vision. A recent research done at Cornell University shows that cooking corn releases beneficial nutrients including carotenoids that can substantially reduce the chance of heart disease and cancer. Ferulic acid is a unique phyto-chemical found in very high levels in corn. Cooking corn increases the amount of ferulic acid significantly. Ferulic acid is effective in fighting tumors in the breast and liver. Corn is a rich source of folic acid. Folic acid is very important during pregnancy for a healthy pregnancy. Corn is also rich in vitamin C, B5, B1, manganese and dietary fiber that you need during pregnancy. During pregnancy, your bodies thiamin requirement increases. Corn contains thiamin that helps the development of memory in your unborn baby. Corns has zeaxanthin that keeps your baby safe against muscular degeneration in the later years. As corn is rich in vitamin C, carotenoids and bioflavonoids which keep your heart healthy by controlling the cholesterol levels. Corn oil also is said to have an antiatherogenic effect on cholesterol levels, hence, protecting against heart diseases. Corn oil is beneficial for the heart health as it has the right amount of fatty acid combination, thus enabling omega-3 fatty acids to remove the bad cholesterol. Corn being a good source of thymine, which plays an integral participant in enzymatic reactions central to energy production as well as brain cell function. Thymine is also needed for the synthesis of acetylcholine, a neurotransmitter needed for memory and whose deficiency can cause age-related impairment in mental function (senility) and Alzheimer’s disease. Corn is a rich source of beta-carotene that is vital for the maintenance of a healthy skin. Corn also has Vitamin C and lycopene which are potential antioxidants that prevent the UV generated free radicals from damaging the skin and increase the production of collagen that help in the maintaining smooth skin. Corn starch is used as an ingredient in many cosmetic products and can even be applied topically to soothe skin rashes and irritation. Corn oil is rich in vitamin K that helps in the absorption of calcium, thus preventing hair loss. The topical application of corn oil helps to keep the hair follicles hydrated, well-nourished and prevents premature aging in hair. The antioxidants in corn oil prevent cell damage by trapping the free radicals. Hence, it is effective in combating dryness and hair fall. Hot oil treatment with corn oil can give you soft and silky hair. Corn contain a lot of water and is rich in dietary fiber but does not contain large amounts of vitamins and minerals. It has a moderate glycemic Index that help the body to break it more slowly than other higher glycemic index foods like white bread. Corn is a great source of vitamin B1, vitamin B5, vitamin C and folate. Corn has a high content of carbohydrates nearly 82 percent of the calories from this food grain. A half cup of corn contains around 80 calories. Corn is high in dietary fiber, both soluble and insoluble fiber. A medium-sized ear of corn provides almost 10 percent of the required daily value of fiber to the body. Corn is a good source of vitamin C.
Corn is also rich in vitamin B such as thiamin and niacin. Corn is a rich source of beta-carotene that is needed for vitamin A formation. The corn kernels have vitamin E which is a natural antioxidant for growth. Corn contains antioxidant phytochemicals. Ferulic acid is a natural antioxidant found in plants which helps in neutralizing free radicals. Corn contains very high levels of ferulic acid which can increase up to 900 percent on cooking the corn. Corn is a healthy addition to your meal when consumed in moderation. Excess of corn or corn oil can cause unnecessary weight gain.